Stuffed Cabbage Rolls is another one of those recipes my mom cooked when I was a kid. 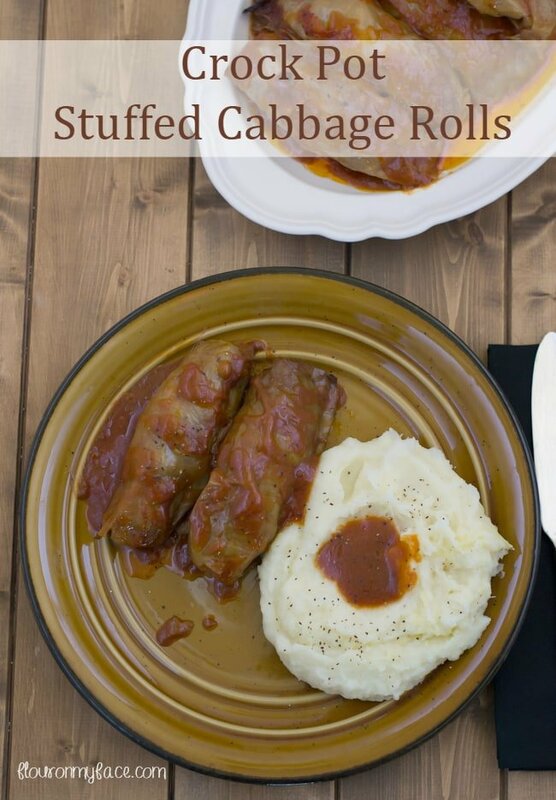 Since I have been sharing my crock pot recipes every Friday for #CrockPotFriday, I decided to share this Crock Pot Stuffed Cabbage Roll recipe this week. It has been years since I’ve eaten Stuffed Cabbage Rolls. No one, not my husband or any of my three children will eat cabbage. Cabbage is something I ate plenty of as a child. My grandparents were first generation German Americans. German’s eat cabbage. We ate stuffed cabbage rolls. We ate Ham with boiled potatoes and cabbage. My grandmother made neckbones and cabbage. I’m not sure what neckbones are and honestly at this point don’t want to know because I also ate them as a child. When I was a kid we ate what was served and liked it. So I had a bad craving for Stuffed Cabbage Rolls like mom made when I was a kid. My mom always used canned tomato soup for some of her recipes like these Crock Pot Stuffed Cabbage Rolls. Well, she never made hers in the crock pot. I decided I’d make her stuffed cabbage rolls into a crock pot recipe. It turned out really good and I had my fix for stuffed cabbage rolls. Matter of fact I got my fill of these Crock Pot Stuffed Cabbage Rolls because I ate them for 3 days straight! Yep, you guessed it……….no one else would eat them but that’s okay because they were so good I didn’t mind eating them at all. Trim the core end of the cabbage and place it in a plastic or glass bowl with 1 cup of water. Place in the microwave and cook on high for 15 minutes. Carefully remove the head of cabbage from the bowl and place core end down into a collander to drain. While the cabbage is cooling mix the remaining ingredients in another bowl. Separate the leaves from the cooled head of cabbage. Fill each cabbage leaf with about 1/4 cup of filling and roll up. Place each cabbage roll seam down in the bottom of a 6-quart crock pot. Pour the can of tomato soup over the cabbage rolls. 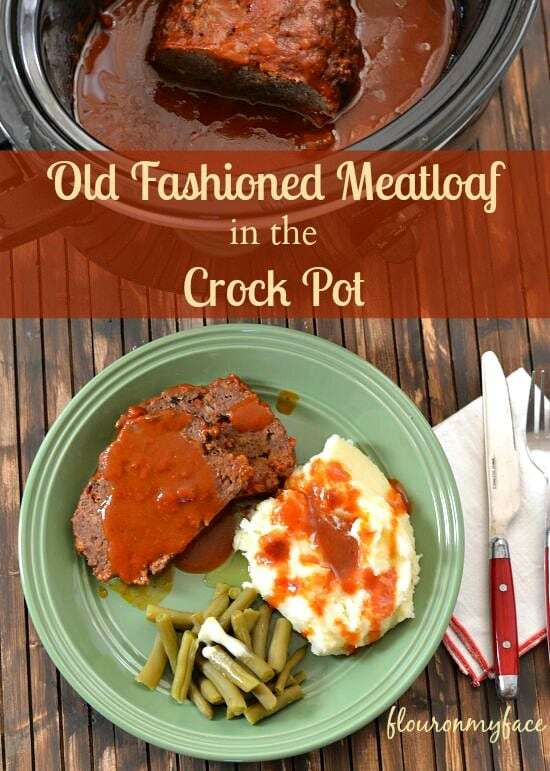 Crock Pot Meatloaf recipe made with Campbells tomato soup. 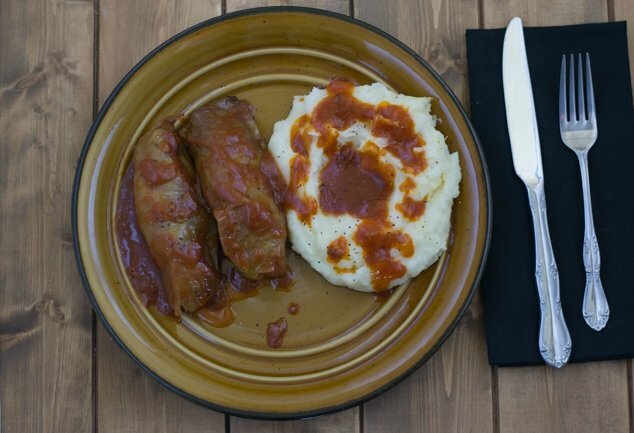 Looking for more recipes like this Crock Pot Stuffed Cabbage Rolls recipe? 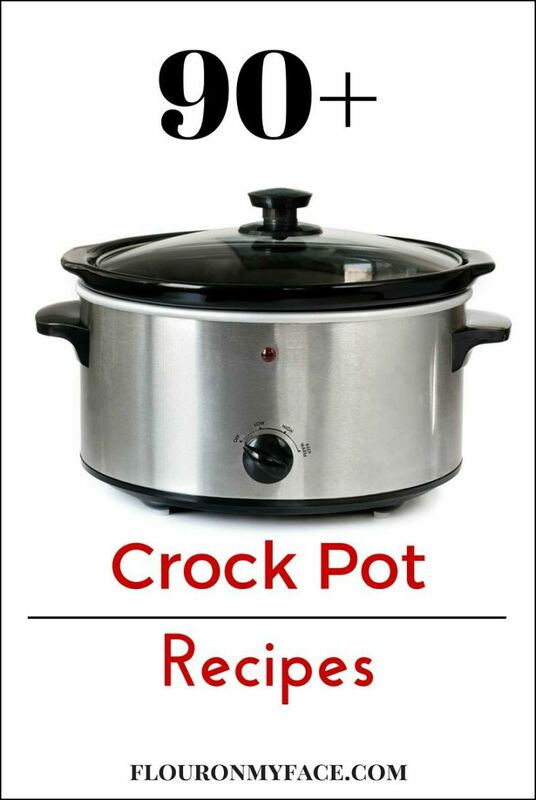 Check out my 90+ Crock Pot recipes on my crock pot recipes page. You are so right. Nothing went to waste back in the days of our grandmothers. Can’t wait to make my cabbage rolls in my slow cooker. Need some help though. When you say “trim” the core, does that mean to remove the core (like I do when I put it in a pot of boiling water) ? And when I put it in the micro, does the core end go into the cup of water ? Thanks so much. I cut a vee out of each piece of the cabbage leave to remove the thickest piece of the core in each leaf. I put the core at the top of the bowl when I cooked the cabbage in the microwave so the steam could work its way up through the leaves. Enjoy! Arlene, thank you for your prompt reply, however I am still confused. I love the concept of using the microwave instead of boiling a huge pot of water, taking out the core and dropping the head of cabbage into the pot and waiting for the leaves to loosen and then cutting out the remaining thick part (vee) of the individual leaves. I am from Muenchen, Germany and have been making & eating cabbage for 60+ years. I want to do things the easiest way nowadays ! So back to my confusion. In your instructions, it states to “trim” the core. I do not know what that means. Do you take the core out before nuking ? I do understand cutting a vee out of each thick part of the leaf. Sorry to be so dense ! Sorry for the confusion. You know how when you peel off the first couple of layers of cabbage leaves because they are wilted or have a few brown spots? Sometimes that makes an inch or two of the stem stick out. I cut that extra piece of stem off so the core is even with the head of cabbage. You could skip that step if your stem is flush with the cabbage head. P.S I have a long line of great grand parents that came from Germany! So I’ve been eating cabbage all of my life! Finally ! I got it! Thank you so very much. Dottie you are very welcome! Enjoy your crock pot cabbage rolls! I come from a Jewish background and my grandma made it the same way except, she made it sweet & sour using brown sugar and sour salt, you only need a litl, it is very powerful. Less is more! Sometimes she would even use honey instead of brown sugar, it is better for ya, if you have acid reflux problems, honey cuts the acid in the tomatoe soup. When I was young, my mother would buy a cabbage, wrap it in foil and place in the freezer. On the day we would make stuffed cabbage she’d remove it from the freezer in the morning and unwrap it and leave on the counter until later when we’d start making the recipe. The leaves are soft and pliable from being froze and we never had to boil, cook, or heat the cabbage first. Some steps and dishes and cooking is eliminated this way. In fact, most of the time we just kept a cabbage in the freezer just for this purpose. Also if some of the cabbage near the core did not got frozen, that was turned into cole slaw. Just thought you may find this interesting.